face to face or facebook? Some people I know believe that face to face communication is too inefficient and even passe. They believe it takes too much time to actually meet and talk. They prefer to manage life efficiently through email, texts, or social networks. This is great for menial, unimportant conversations, but efficiency is not the best way to build relationships. Social scientists say that between 60-85% of the information exchanged in human conversation is non-verbal. That means that online conversations are lacking in quite a bit of information. Things like tone, context, and intensity are difficult to convey, particularly in short form content like posts on Facebook and Twitter. Others I know swear off social media and digital interaction as a waste of time. They view face to face communication as the only worthy path. They see social media as idle chatter and wasted hours. While in person conversation is the best tool for rich conversation, time does not scale and not every conversation is vitally important. You simply can’t make time to meet with everyone. Meeting with people can be very effective, but it is incredibly inefficient. Imagine if you had to meet with each of your facebook friends to have a conversation or make a simple decision. Social and digital media are excellent for managing the day to day, low level conversations of life in ways that in person communication can’t. 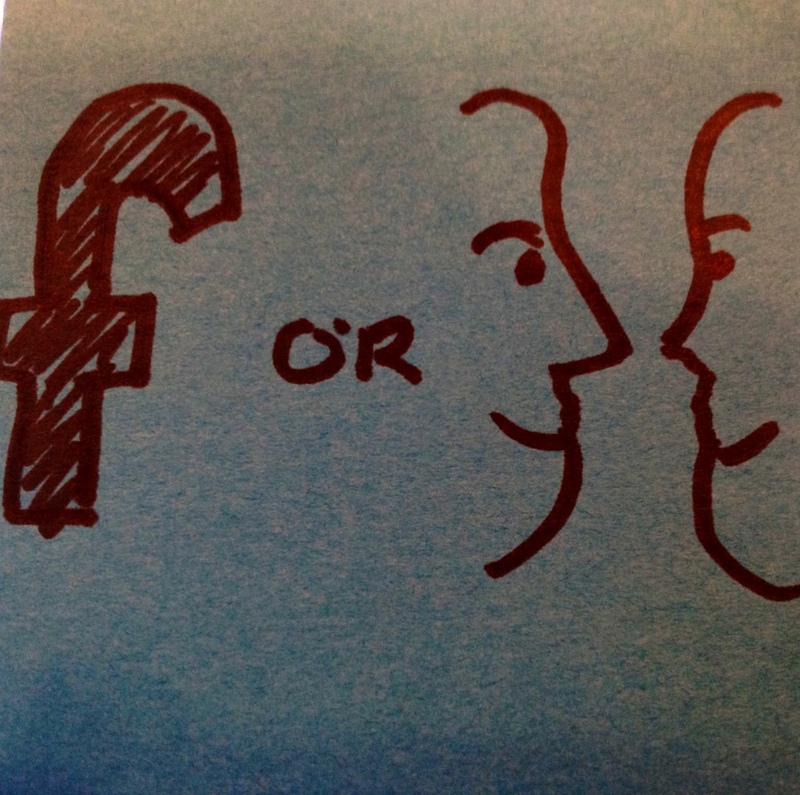 The answer to the question of face to face or facebook is that the question itself is wrong. It is not an either or situation. I believe the best approach is somewhere in-between. When you make a new connection at a business meeting, connect with them online. Connect with people from your past, people from your present, and people you want to meet in the future. Use social media to manage relationships, understand more about the people you are connected to, and determine ways you can help people solve problems. Don’t stop there. Then use social media as a means for driving face to face connections where you can have an educated, deep, patient conversation. Social media makes it possible to walk into a conversation with a great deal of information – to be prepared to be a good discussion partner. By showing interest in others you become interesting to them. Social media and face to face communication should not be at odds with one another. The better question to ask is how do you use each of these channels appropriately to amplify the other. How do you learn more about people so that you can earn their trust and actually help them. Whether you prefer facebook or face to face communication, you need understand the value of each and use them and other tools wisely.